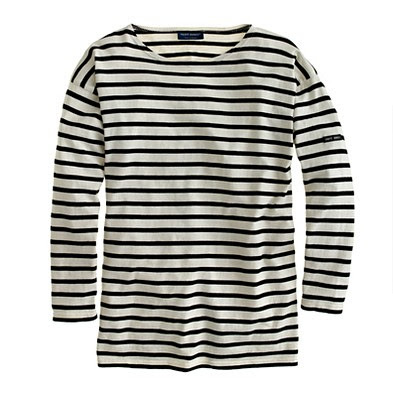 I really, really want a black and white stripe t-shirt just like this one from JCrew - but without the JCrew price. I'm sorry...but I just can't stomach shelling out $75 for a basic top. I've looked all over Target, Forever21, ShopRuche, etc. thinking surely they would have a basic black and white stripe shirt. Hmm I would try the jcrew outlet. They seem to have a lot of the basics for much, much less. There is a "cream combo mohair tissue striped shirt" on Ideeli.com today. It's on page 2 of the "modern faves" section. it looks similar but not sure if it is what you are looking for. I don't know, but let me know when you find one! I've been wanting that same style of shirt and I'm definitely not shelling out $75 for one! ooh girl, i am fairly certain the jcrew outlet had some very similar to this! go check it out! J. Crew outlet seems to have similar items at lower prices when I've looked for things. Also JcPenney and Land's End have some similar items. Stripes seem to be getting popular for spring and summer so more might be coming out. My husband one of the managers at the West Marine in Mt P (the one in the Triangle Char shopping center. They have a brand called Lole and they have a shirt in the clearance section that looks very similar.